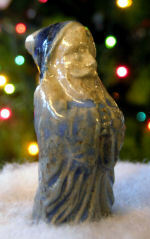 The original Blue Santa pictured here was found at Lock 3 Park in Akron, Ohio during an archeological dig by The American Toy Marble Museum. It was manufactured on the site by The American Marble & Toy Manufacturing Co. in the mid - 1890s. This company was the first toy marble factory in the USA; it mass produced a million marbles a day and turned out dozens of other toys including the Blue Santa.